American cyclist Tyler Hamilton announced his retirement Friday after testing positive for the steroid DHEA, which he said he knowingly ingested in an over-the-counter herbal antidepressant. 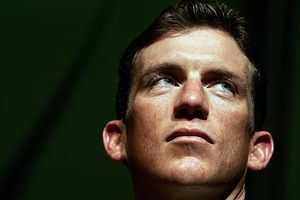 AP Photo/Gregorio Borgia Tyler Hamilton told ESPN.com he knew that the DHEA in his medication was on cycling’s banned list but that he did not take it as a means to enhance his performance. It was the second doping offense for the veteran rider, who tested positive for homologous blood transfusion in 2004 and served a mandatory two-year suspension even as he disputed the test results through two rounds of arbitration. Hamilton likely would face a suspension of eight years to life for his second offense. Hamilton, 38, said he decided to admit to the violation in order to concentrate on an ongoing battle with clinical depression that was first diagnosed in 2003. At the time he bought the supplement, which is marketed under the brand name Mitamins Advanced Formula for Depression, Hamilton was in a “desperate” emotional state triggered when he went off his prescription medication cold turkey, he said. DHEA is clearly listed among the over-the-counter drug’s ingredients. He added that he regrets any negative impact the events may have on the sport, and feels he has let down his Rock Racing teammates and owner Michael Ball, who offered him a job in late 2007 when Hamilton was considering quitting the sport. Ball said he trusts Hamilton’s account and supports his decision, albeit with mixed emotions. One of the best-known and most accomplished American cyclists of his generation, Hamilton spent the first half of his professional career with the U.S. Postal Service team and became one of Lance Armstrong’s most valuable support riders. Hamilton went on to lead two different European teams, CSC and Phonak, but his reputation began to unravel in 2004 shortly after he won the Olympic gold medal in the time-trial event. A month later, an anti-doping test at the Tour of Spain revealed the presence of another person’s blood in his system. Hamilton’s unsuccessful defense attacked the science behind the test and offered a number of alternate explanations for the result, but his credibility suffered in the process — a situation that was exacerbated by documents that later surfaced linking him with a major doping investigation in Spain. He denied any involvement, and like many names floated in the Operacion Puerto scandal, Hamilton was never charged or cleared. Hamilton said he knows his explanation of his recent positive test will be met with skepticism in many quarters. He said he stands by previous assertions that he did not previously use performance-enhancing drugs or illicit blood-boosting techniques. A case against Hamilton will proceed despite the fact he is retiring from competition. As outlined under the U.S. Anti-Doping Agency’s protocol, a panel of scientific and legal consultants reviews the evidence to decide whether the agency should pursue a case and if so, what sanction to recommend. The accused athlete then has 10 days to decide whether he wants to contest his case in arbitration. A lengthy suspension would be moot in competitive terms since he does not intend to race again, but it could affect his ability to come back to cycling in another capacity and further impact his image. He could try to present mitigating circumstances to reduce the sanction. “We’d like to work out a resolution that complies with the rules but also takes Tyler’s circumstances into account,” said Chris Manderson, Hamilton’s Irvine, Calif.-based attorney. Hamilton said the events that led up to his positive test in early February began in late 2003 when a Boston physician diagnosed him with clinical depression. The Marblehead, Mass., native had just enjoyed the most successful season of his career, finishing fourth in the Tour de France. “From the outside, my life was going great, but on the inside I was going to pieces,” he said. Depression runs in Hamilton’s family and has affected his mother and his maternal grandmother, who committed suicide. His older sister, Jennifer Linehan, who also said she suffers from the illness, said she felt her brother might be susceptible some time before he sought treatment. Hamilton said he kept his condition a secret from all but family and a few close friends. Dr. Paul Berger of the Boulder Holistic Medical Center confirmed that he has prescribed medication and treated Hamilton for depression, anxiety and sleep disorders for the past two years. The cyclist took the prescription antidepressant Celexa for several years and found it was effective. But 2008 proved an especially challenging year personally as he split with his wife of nine years, and his mother, Lorna, was diagnosed with breast cancer. Hamilton said he doubled his dose of antidepressants and found himself struggling with the side effects. He then decided to stop taking the medication altogether — “a big, big mistake, something I might never forgive myself for,” he said. Hamilton trained erratically last winter, much of which he spent in the Boston area to be with his ailing mother, and arrived at Rock’s Southern California training camp in early February out of shape and very much out of sorts. Hamilton said he took the supplement for two days before he was targeted for a surprise out-of-competition urine test at the team hotel on Feb. 9. “But whether it showed up positive or not, it was wrong, and I should pay the consequences,” Hamilton said. The B, or backup, sample confirmed the first result. DHEA is produced naturally in the body by the adrenal gland and eventually can be converted into other hormones including androstenedione, testosterone and estrogen. Claims about DHEA’s effectiveness as a muscle-builder, fat-burner and anti-aging tonic — and its potential to treat numerous other conditions, including depression — are a subject of debate. It is a scourge for those concerned about doping in youth sports, as it is readily available in over-the-counter supplements and online. Does Fun Run Robbie thinks he is Lance Armstrong? Cycle to school week in the u.k.
THOUSANDS of Britain’s school children wish that they had the freedom to cycle to school every day, according to a survey. More than 55 per cent of nine to 11 year-olds think that cycling to school is more fun than going by car and believe it would help them perform better in the classroom. At least one third of primary school children questioned said if they could cycle to school they would arrive feeling less lethargic and better prepared for the day ahead. The survey, conducted by Cycling England, coincides with Bike to School week, which kicks off today, reveals that kids want the brakes taken off their freedom to cycle. Only one per cent of the UK’s school kids bike to class because parents are too worried for their safety. Cycling England spokesman Paul Robison, said: “Concern about safety is entirely natural but we need to remember that on-road accidents are in long term decline. “Cycling is a life skill, and one that the vast majority of children want to master. “We know that cycling to school, to friends, or just as a fun activity in its own right, can play a hugely positive role in a child’s overall development. “With more children recognising the benefits of cycling, this year’s Bike to School Week presents the perfect opportunity for as many children as possible to benefit from Bikeability. The survey also reveals that youngsters are keen to exploit the environmentally friendly aspect of cycling, with 74 per cent believing it’s a green way to travel. And the kids care about mum and dad’s pockets too – with nearly 60 per cent understanding that it would save money on petrol. A further 39 per cent said they hate being “stuck in traffic” and would love to escape on their bikes. And the results reveal that cycling more would boost children’s social skills with nearly half of them saying riding their bike to school would mean they could spend more time with friends. Transport Minister, Paul Clark, said: “It’s great that children would prefer to cycle rather than be driven to school, which is not only better for the environment, but better for their health and fitness. But nearly 40 per cent of kids said their parents wouldn’t let them ride bikes to school because of safety concerns and over a quarter said they didn’t feel they had the right skills to tackle the challenge. Bike to school week will see Cycling England calling on all schools to take up their Bikeability course – cycling proficiency lessons for the 21 st century. Mum of three, Sharon Joinson, from Leicester, said: “Bikeability has given my children the skills and confidence they need to cycle safely, teaching them to act like any other road user. “Knowing that my children have completed their Bikeability training gives me the reassurance I need to let them cycle to school. Mrs Joinson’s son Ben, 11, said:”I love riding my bike and would like to ride my bike to school. Here in Germany, kids have to pass their cycling proficiency exam whilst at junior school i.e. aged 8 or 9. The Police examine the bikes and set the examination route on actual roads. Prior to the exam, the children are taken to a training centre, which has a miniature road system, complete with stop signs and traffic lights. This is free and children are able to practice as much as they want to i.e. at weekends and so on. Children are NOT allowed to ride bikes on the road unless they have passed this exam. My two have passed their exam, my youngest passed hers just before Easter. In order for my children to cycle to school, all I have to do is write a letter to the school giving my permission, for insurance purposes. There are some cycle lanes, but these are not widespread. Children here are taught to ride responsibly, and must wear helmets. Instead of moaning and wishing kids could ride their bikes to school in the UK, why not do something about it and train them properly. The two clubs which have shaped Fun Run Robbie’s, sporting ambitions, teviotdale harriers and Verulam cycling club. FRR has raced against Olympians and international athletes during his time with the above clubs. With both these clubs FRR adopts the moto “there is no hiding place on the road” On the group photograph FRR can be seen on the back row. The Amstel Gold Race is a road bicycle race held (mostly) in the southern part of the province of Limburg, The Netherlands. Since 1989 it has been among the races included in season long rankings tables, as part of the UCI Road World Cup (1989-2004), the UCI ProTour (2005-2008) and the current UCI World Ranking. The name does not directly refer to the river Amstel, which is far away from the course, but to the sponsor, the Amstel brewery. The first race, on April 30, 1966, was organised by two Dutch sports promoters, Ton Vissers and Herman Krott, who together ran a company called Inter Sport. Vissers was a house decorator and hockey player from Rotterdam whose break in cycling came in 1963 when a friend asked him to manage a minor team in the Tour of Holland. Those who were there say he was as hopeless as his riders. Officials banished him after he did a U-turn and drove back towards the oncoming race after hearing that one of his riders had punctured. Three years later, in 1966, he became manager of the Willem II professional team that at one time included the classics winner, Rik van Looy of Belgium. Krott’s background in cycling was scarcely deeper. He ran a car-parts dealership called HeKro and, because he admired the Dutch rider Peter Post, worked as his personal assistant. He had also worked as a salesman for Amstel. Together, Krott and Vissers organised small races across the Netherlands. Krott also used his contacts at Amstel to start an Amstel professional team and then the sponsorship to run an international professional race bigger than the round-the-houses events Inter Sport had been promoting until then. The first Amstel Gold Race was announced for April 30, 1966, the national day of the Netherlands. The plan was to start from Amsterdam and follow a 280km loop round the east of the country before finishing in the south-east at Maastricht. There would be prizes of 10,000 guilders – about €5,000 – of which a fifth would go to the winner. Things started going wrong from the beginning. Krott and Vissers had announced the start, the finish and the distance without taking into account the many rivers and the zigzags needed to cross them. The course would be far longer than 280km. Further plans were made to start in Utrecht, then in Rotterdam. The finish was moved from Maastricht to the unknown village of Meerssen. Less than three weeks before the start, the organisers realised they had not obtained permission to cross the Moerdijk bridge, the only way out of Rotterdam to the south. The route had again to be redrawn and the start moved to Breda in the south. The problems had not ended. Whatever the police thought of the constant changes they were asked to approve, they now had bigger concerns. The Provos, militant hippies, had declared Holland a state of anarchy. At the other end of the social scale, Dutchmen were also protesting against the marriage of the queen’s daughter, Beatrix, to a German, Claus von Amsberg. The police feared that a race organised on the royal family’s big day would bring uprisings and possibly attacks. On April 26, Vissers and Krott called off their race. But still there was a twist. A press conference to break the news had just started when the Dutch roads ministry in The Hague called to say the race could be run after all – provided it was never again scheduled for Koninginnedag. The race was run, there were no serious protests, and the conditions set by the roads minister lost their significance. The Amstel Gold Race has never started in Amsterdam, Rotterdam or Utrecht and it never again started in Breda. The finish was moved to Maastricht from 1992 and after 1998 the race also started there. Inter Sport ceased trading in 1970 and Herman Krott ran the race by himself until 1995. It was then taken over by the former professional Leo van Vliet. As is not unusual for road cycling races, the course has changed many times over the years. In 2005 the race took place almost entirely within the boundaries of the province of Limburg, but there have also been editions that covered significant parts of Belgium. Since 2003 the finish is at the top of the Cauberg hill, in the Valkenburg municipality. Before 2003 the finish used to be in Maastricht. The race is the Netherland’s largest professional race but is frequently criticised for the danger of its course. The Netherlands is a densely populated country and the race runs through many suburbs and villages. With pressure on land being so great, many Dutch houses do not have garages and cars are left parked in the street. There are also many traffic-calming obstacles such as pinches, chicanes and speed humps, and further obstacles such as roundabouts and traffic islands. The course is tough and selective, mainly because of the 31 hills that have to be climbed, some with angles as steep as 20% (Keutenberg). The Amstel can be confusing for first time riders, because the course features a lot of turns, plus some spots are visited more than one time during the race.